Hello m'fellow Trustinvoguers and newbies! I apologize for not posting in a couple of days, I've had to work (I work at River Island) and the sales are on. Which means only one thing. CHAOTIC! Yup, I'm a self confessed shopaholic, but when you're behind the scenes working as a sales assistant, you can really see how crazy people get over a pair of shoes in their size or a killer dress for a bargain price. But anyway, that's my excuse! 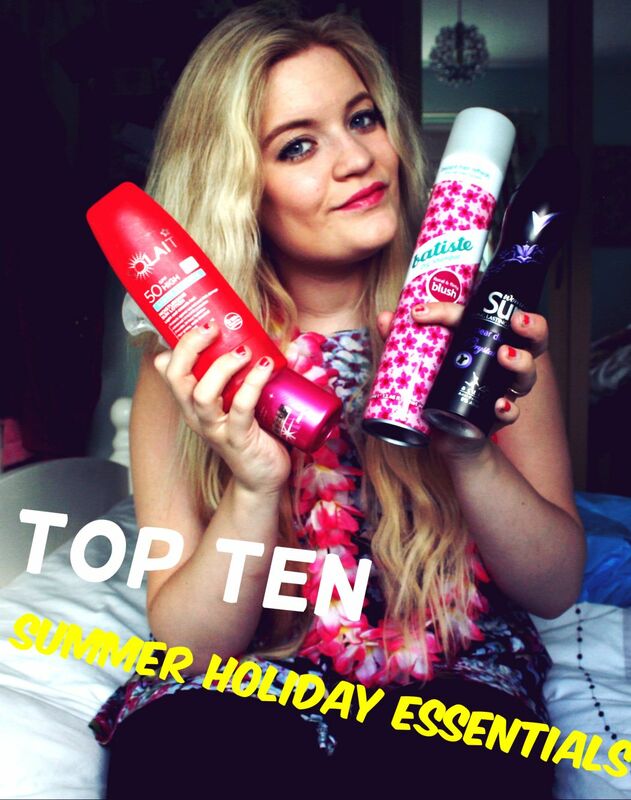 As promised from my previous returned-from-holiday post, I'm going to do a 'Top Ten Summer Holiday Essentials' post, which features my personal preference items, so you don't have to entirely agree with me! 1 & 2. Suncream & Aftersun. These to me, are seen as one combined because they're both just as important as the other. They're the holy grail of a hot Summer! It was Solait that I used on holiday to Malta, which were quite surprisingly quite good seeing as they're a Superdrug brand. However, I'll be sure to get a 30 or lower, instead of an SPF of 50 - as I didn't tan at all! Oops! But yeah, we all know how important things like sun-cream are on holiday, so of course, this had to be number one. 3. Tired out from Ibiza clubbing, in an airport rush? No fear! Batiste saves the day. I've featured this original Batiste in many of my 'monthly favourite' posts, so it had to make it into my 'Top Ten Summer Holiday Essentials'. Perfect for sprucing up dull or greasy-looking hair, it's my go-to for a quick hair rescue. 4. Of course, you can't forget your deodorant on a Summer holiday! Especially if you're going somewhere rather hot. Always carry deodorant on you, wherever you go be it in your clutch-bag or man bag! the mini travel ones are also quite helpful. Although it's rather horrible, we all do it - we all sweat when we get hot! I'd highly recommend Sure for both women and men, or Mitchum. 5. Even if I've used a waterproof mascara, when I've been in the sea or swimming pool, I nearly ALWAYS get panda eyes. I know, attractive right?.. I usually use Simple cleansing wipes, however I've recently used these 'Bodycare' ones because they had an offer on. No wonder they had an offer on, these were terrible and hardly got any off and left my skin red and sore. DO NOT BUY THESE! But in general, for a Summer Holiday i'd definitely suggest getting yourself some makeup wipes, as not only do they clean up your face, they help in multiple ways from cleaning up your ice-cream or the extra sun-cream that's spurted out of the bottle! 6. I don't know about you guys, but this next product is an absolute essential for me. I absolutely loved it both at home and on holiday. My hair tends to get rather dry and frizzy when I'm on a hot beach holiday, especially with having blonde hair. But VO5's Heat Protect Styling Spray works a treat. It keeps the hair in as good condition as it would if you were at home - without the added heat! 7. Next up, Is a summer fragrance. That's got to be a must, right? (Oh, you may need bug spray, because they can be attracted to perfume!). My favourite fragrance for this Summer was tied against Marc Jacobs daisy, however this won. It is the DKNY Summer fragrance from a good few years ago, unsure of it's proper name if there is one - sorry! As you can tell, it's rather loved as the top is missing, and it's soon going! 8. Aussie Miracle Hair Insurance. Perfection in a bottle? I think so. I love all the Aussie Products, but this is actually possibly my favourite. It smells absolutely LUSH! and it's great for the hair too. I use it with damp hair after the shower, which turns beautifully wavy when it dries. 9. Ever wanted to know what the perfect moisturizer is? Especially for dry skin? Then look no further. I highly recommend Elemis Daily Moisturizer, it isn't chemically or anything like that. It feels great, it moisturizes my skin to a great extend that it doesn't feel too oily. LOVE. You can buy this for £20. 10. In my opinion, you can't go on a summer holiday without a book to handle (or a kindle for that matter!) I've recently been reading 'Revenge Wears Prada', the sequel to the famous 'The Devil Wears Prada'. I really recommend it! Thumbs up to Lauren Weisberger. 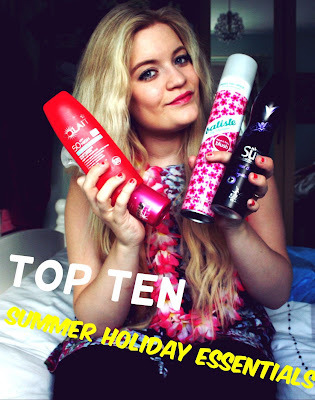 What do you think to my 'Top Ten Summer Holiday Essentials' list? I love the batiste dry shampoo! One of my favs! Cleansing wipes are so convenient when you are travelling, because you don't have to carry a bottle with you. But I've never tried the Simple cleansing wipes. Aussie products are fab, I agree, xoxo. Love this! Dry shampoo is a life saver!